Casement windows are the standard choice for new or replacement windows in residential and new build projects. Aluminium is beginning to be recognised as the optimum material for window frames and our Smarts windows are at the forefront of developments in new aluminium technology. Both stronger and slimmer than uPVC frames, aluminium is also durable, low-maintenance and, now with a polyamide thermal barrier, extremely energy efficient. Keep reading for more information about the product specifications for aluminium casement windows or read more about buying from Amberley. Choose from a range of frame widths from 47mm, 55mm or 70mm deep (front to back), with either equal leg or odd leg to suit your requirements. Windows can be either externally or internally beaded and double glazed or unglazed depending on your needs. Our aluminium casement windows are available in ovolo, chamfered or square main profiles, plus heavy-duty versions of these. Other features include shoot-bolt locking, excellent weather performance (BS6375 Parts 1 & 2) and compliance with PAS 24. They are available in any standard RAL or British Standard finish in single or dual colour. With its slim sightlines, this contemporary casement window is a popular option, allowing for maximum natural light and views to outside. Choose from a range of hardware to complement this classic window. Enquire about top hung casement windows. Probably the most popular option for residential applications, the side-hung casement window is available in a range of configurations, such as open in and open out options, and colours and finishes to suit every individual project. Get a quote for side hung casement windows. This non-opening window frame is designed to allow large glass facades made up of many smaller double glazed units, for high levels of natural light without compromising on cost or thermal efficiency. 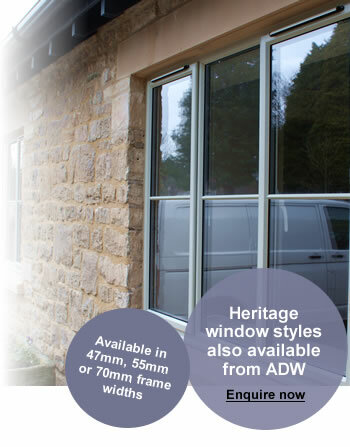 Get a quick quotation for fixed light casement windows. When specifying for aluminium windows for listed buildings or conservation areas, our double-glazed slimline heritage casements count as a like-for-like replacement. Similar to metal-framed windows like old steel and crittall windows, these heritage alternatives exceed modern-day security, weatherproofing and thermal efficiency standards. Learn more about the product specifications for our Enquire here.